Households that are not served by public sewer usually depend on septic systems to treat and dispose of wastewater. Septic systems are a significant financial investment; if properly cared for, a well designed, installed, and maintained system will provide years of reliable service. - The Septic Tank: A typical septic tank is a large buried rectangular or cylindrical container made of concrete, fiberglass, or polyethylene. The purpose of this tank is to stores and separates solid waste from wastewater, enabling the solidwaste to decompose as much as possible. - The Drainfield: The drainfield is a network of perforated pipes laid in gravel-filled trenches or beds. After solids settle in the septic tank, liquid wastewater is discharged to the drainfield where it is filtered and treated by the soil. The size and location of the drainfield depend on local soil conditions and water flow. 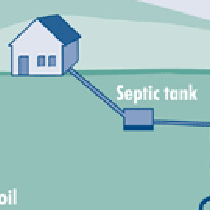 - The Soil: The soil below the drainfield provides the final treatment and disposal of septic tank effluent. After the wastewater has passed into the soil, organisms in the soil treat the effluent before it percolates downward and outward, eventually entering ground or surface water. The type of soil impacts the effectiveness of this treatment (clay soils may be too compressed to allow wastewater to pass through and gravelly soil may be too course to provide much treatment), therefore a proper soil analysis is essential for an effective and environmentally safe system. - Avoid Septic Additives: Adding a a stimulator or enhancer to a septic tank is not necessary; the naturally occuring bacteria needed for the septic system to work are already present in human feces. Watch this space for helpful information regarding septic system installation, design, and maintenance.